Hi Francis, thanks so much for agreeing to this interview and for showing us round the distillery. How long has the farm been in your family’s ownership? Daftmill has been owned by our family since 1984 and before that we were tenants on the farm, the family has always had a farming background, with both crops and cattle. Were you already producing barley for other distilleries before you decided to distil your own whisky? Yes, predominately that is what we farm, malting barley, although we do have beef cattle also. Producing 800 tonnes of barley in total with about 100 tonnes of that used by ourselves at Daftmill. Can you tell us which distilleries you also supply? We supply barley for Simpson Malt in Berwick who supply the Edrington Group (Highland Park, Macallan). 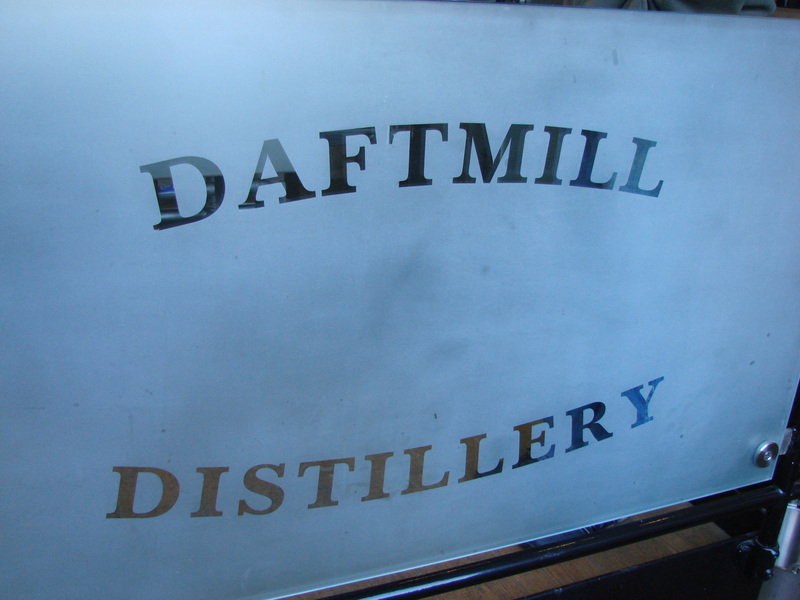 Daftmill also produce a high diastatic power barley for North British (grain distillery), based in Edinburgh. What made you take the decision to produce your own whisky? Not really sure, a desire to pay more tax maybe? It started as an idea that was kicked about for a long time, and the more we drank, the more the idea grew, we talked about it lots and then we decided to go for it. You’re still a very much family run farm, was it a family decision to go into whisky production? The family all decided together, at the start it was a bit of a family joke and was mainly spoken about in jest. When the family started farming, barley sold at £70 per tonne, and we were looking for a way to add value, just like our ancestors would have done over 200 years ago, take something that wasn’t very saleable and make it more valuable and desirable. Unusually, you have funded this entire operation yourself, why is this? It seemed by far the easiest way, you can make all the decisions yourself and within the family. Far less red tape and less pressure. The most effective committee is always a committee of one. Has it been more difficult than you thought to manage both running a farm and a distillery, you must be constantly on the go? Not as difficult as you may think. It is however very time consuming. It’s impossible to be in two places at once. I can’t remember ever taking a holiday. I am happy to do it all myself though. I suppose the discipline from keeping livestock keeps you focused on the job. How did you learn about the whisky process? Did you need to call in “experts” from other distilleries to help you with the start up? To start with I read some books, I learnt as much as I could, I think really that knowledge is genetic, any Scotsman can make whisky. I did need to call in a few consultants from various agents at times at the start. Do you employ any staff to help you with the whisky process? Only myself, sometimes we have a summer student in the distillery, more to help pass the knowledge on rather than a necessity for help. You’ve decided to make this whisky very much in the Rosebank style, why is this? Being Lowlands we thought we would try and make what we thought a typical lowland whisky should be, which is like a Rosebank, we are not trying to copy Rosebank, they closed in 1993 and most of the stock has now been sold, but in my opinion that is the closest in style to the whisky we distil. Our whisky is very different to Glenkinchie which is probably the other most famous Lowland whisky. Where did you purchase your equipment? You use a lot of copper, and all your equipment is designed for maximum spirit to copper contact, why is this? The stills were made to order, from our own specifications by Forsyths in Rothes, everything else is made locally, washbacks can be made by any steel fabricator really. Houstons in Cupar made the stainless steel tanks and Greys made all the mesh flooring, these companies work for oil industries and offshore wind turbines as well as farm equipment, so they can build most things. The reason for so much contact with the copper is to really impart through the flavours, distilling in this way produces the fruity flavours that we were so keen to achieve, it also allows us to have shorter run times. Everything is designed with efficiency but more importantly, optimum flavour in mind. It really is all about the whisky at the end of the day. Is it quite important to employ locally. Yes, we have used these companies previously, so we could attest to the quality of their work. Community is important to me, if you can use local companies then I feel you should, it keeps work and money in the community. Currently your barley is unpeated, will you ever release a peated version? This is something we might do, there’s nothing difficult in making peated barley and then a peated whisky, however we wanted to concentrate on perfecting our whisky first, without trying to concentrate on too many styles at once, it’s far better to do one thing well than do 100 things mediocre at once. Will you release the final whisky as an ex-sherry or ex-bourbon or a combination of the two? We have the option of doing either or both. We can release a cask strength or we can blend it for a house style, we will probably end up doing bits of both. With your current capacity you will be the smallest working distillery in Scotland, are there any plans for expansion or will you use this as a USP. How can you measure this? Size of stills, size of production? It doesn’t seem anyone person can quantify this. We will certainly be amongst the smallest with a 1 tonne mash. In terms of production we want to produce about 20,000 litres, Kilchoman produce 120,000 litres, but they work far longer hours and employ several staff. Sometimes we don’t hit our targets, last year we didn’t hit our targets as we had a new boiler fitted which meant we lost a month of distillation. Seeing as we only distil whisky four months of the year one month downtime is a big loss, however that’s just the way it goes, the boiler was late and we had teething problems getting it set up. We may decide to expand, maybe add an extra warehouse amongst other things, but that would invariably need more planning permission and building works. When do you anticipate being ready to bottle and sell? Another year or two yet, we will possibly sell it as a ten year old, but we’re really not too concerned about age, the product will speak for itself and there is no need to compromise quality over age. Also if we wanted to sell a specific 10 year old it wouldn’t be ready until the end of 2016 as we only started to distil in December 2005. We are far more interested in the quality of the product, we have the option of selling as a single cask or as a vintage as opposed to a set age. Will there be a set first release, which would be limited edition? Yes something along those lines. The difficulty is in working out costings etc. There is a fine balance with what’s an affordable price for both the customers and then us as a distillery. For larger companies, such as Diageo etc they sell to supermarkets at a very low return, however they are producing so much that they can afford to do that, however smaller independent distilleries don’t have this luxury and therefore need to charge more. How many bottles will you have available for sale, once you are ready to go? 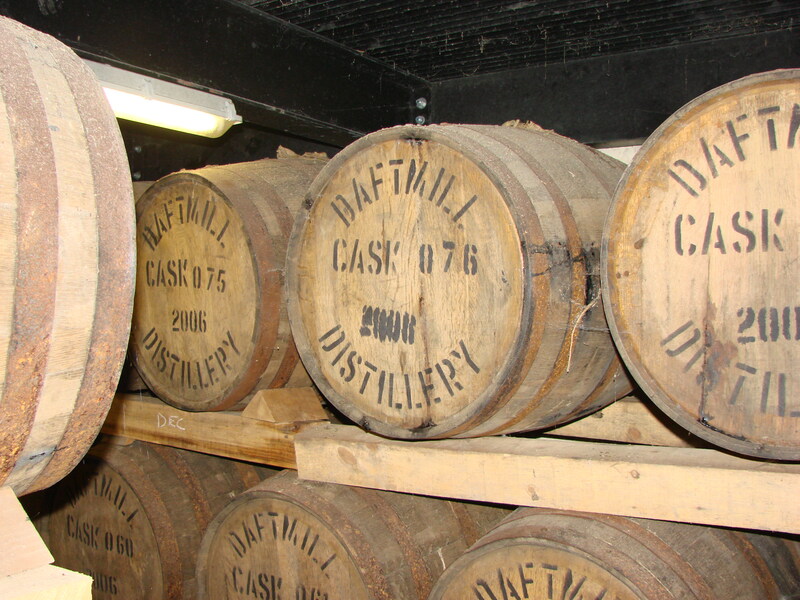 Not a lot, it all depends what the casks give up and there aren’t a huge number of casks. We don’t want to release all of our stock and want to carry the majority of the stock forward. Will you release all of the whisky when you are happy with the age, or will you keep some for far longer, (maybe a 15, 18, 20 etc)? This is the plan at the moment, however it really depends on how everything sells. If we prove to particularly popular than we can release most of the stock and then I have no problem with selling the rest of our stock as NAS. I want to be able to make enough money to allow us to continue making more whisky, that’s the most important thing for me. Is there any reason you didn’t release the whisky before now? Mostly because we didn’t need to, when it comes to our whisky we have lower overheads and no staffing costs, we aren’t under the same pressure that many distilleries, both old and new find themselves in. How does it feel to be one of a few Lowland distilleries? It is a great feeling, especially when we were starting up, although, almost every week it seems more distilleries are announced, which is a good thing if it takes off and they actually go into production, Kingsbarn Distillery certainly seems to be. We are the first of the new lowland distilleries to be in production though. How will you market your product, will you primarily sell the whisky yourself or will you use specialist shops? The plan is to sell through specialist whisky retailers, we may however, decide to distribute ourselves, depending on time constraints. If we market ourselves overseas as well (which is the plan), we would use local distributors, they would be invaluable for their local knowledge and for crossing any language barriers and of course with being so busy myself it makes more sense. I still need to have time to run the farm and continue to produce enough barley. Carry on as we are at the moment, as mentioned previously, we are considering adding on an extra warehouse, we aren’t planning on a massive visitor centre, as we are still a working farm and this is very important, but this is something we can take a further look at once we have released the whisky for sale. A lot will just depend on our popularity and the demand for our product. We are lucky enough that we can make our own decisions, this gives us the option to just play events out and react to them. What will you call the whisky? Will it be known as Daftmill (especially given the story behind the name), or will you have different names for different expressions? We don’t really have a clear idea of that at the moment, we may just call it Daftmill and then the age, or single cask, or something altogether different, it’s something that we need to consider nearer the time of release. I’ve always been a big whisky fan, all of the family are. I can’t remember my first one but I have a feeling it would probably have been a Bells or a Grouse, something along those lines. Do you have a favourite whisky? This is something that changes frequently for me, at the moment it’s probably an Old Pulteney, but I’ll try most whiskies, and although it’s not a particular favourite whisky of mine, I had a really good Jura once, a very old bottling that a friend had bought at auction and it was really superb. (Francis shows us a picture of the bottle on his phone and it looks very special indeed). When you’re not busy with the farm or busy making whisky, what do you like to do to relax? I like to make whisky, I like to attend tastings and whisky festivals, I go to the Glasgow Whisky Festival and to the Edinburgh Whisky Fringe. There are only so many festivals you can attend though before they all get a little repetitive, once you have tasted most of a distilleries range there isn’t all that much more to be gained from the festivals. I think whisky festivals and the current upturn in whisky places a lot of pressure on distilleries to release more whisky and more expressions as people are keener than ever before to try something new and exclusive. Thanks Francis, that’s our interview finished, I really appreciate you taking the time out for this, as I know how busy you are.